For other uses, see The Killer Inside Me (disambiguation). 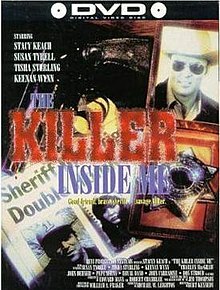 The Killer Inside Me is a 1976 American crime drama film directed by Burt Kennedy and based on Jim Thompson's novel of the same name. In this adaption, the action was shifted from the west Texas oilfields to a Montana mining town, and several other changes made. It stars Stacy Keach, Susan Tyrrell, and Tisha Sterling. A 2010 remake was directed by Michael Winterbottom. Usually a law officer is a figure of trust in a small community. Unfortunately for the residents of a small Montana town, Lou Ford is an exception. Behind his easygoing, likeable shell is an intensely violent core resulting from an abusive childhood. In a diner one day Lou sees his dead father and hears voices, the first hint that he may have mental problems. When Lou gets involved with a local prostitute's blackmail schemes, the carefully crafted facade he maintains begins to unravel into a vicious killing spree that leads to a thought-provoking and disturbing conclusion. ^ "The Killer Inside Me (1976) - Trailers, Reviews, Synopsis, Showtimes and Cast". AllMovie. Retrieved 2014-05-14. This page was last edited on 29 March 2019, at 14:44 (UTC).